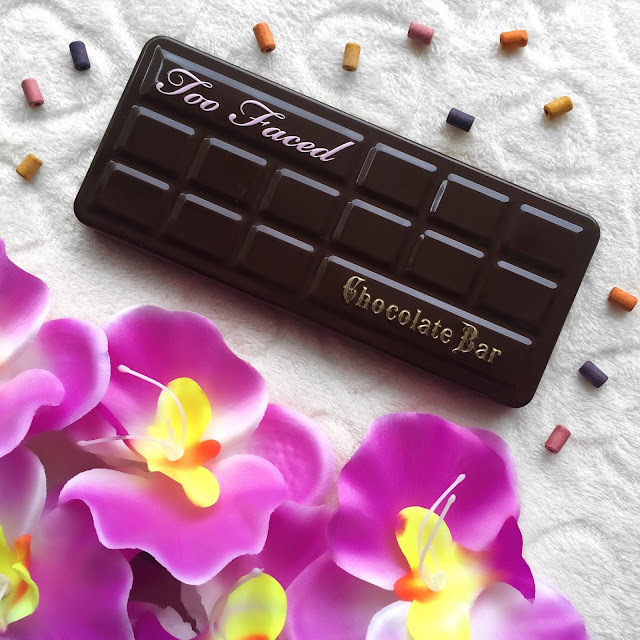 I guess that you can already tell that there is a slightly obsession going on with eyeshadow palettes at the moment!Today i will present to you a well known and famous one,the Too Faced Chocolate Bar Palette!I wanted this palette for so long and i finally get it! 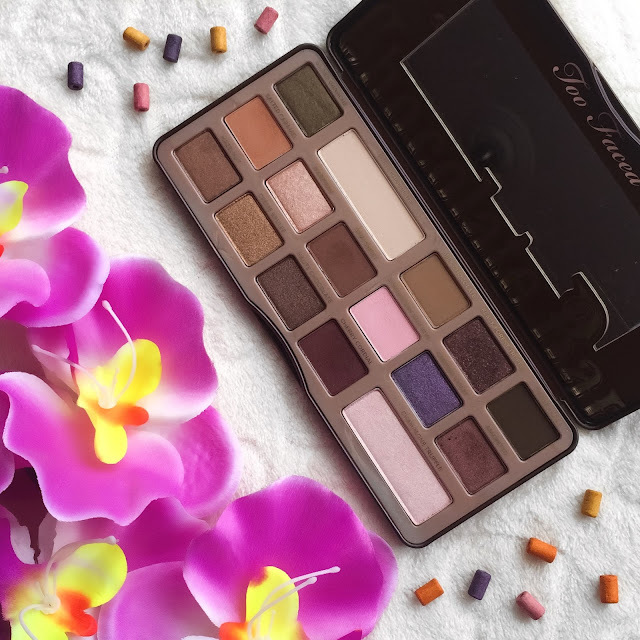 I already used it quite a lot,if not everyday and i create also a makeup look for a post here,on the blog and seems like you like it so i said why not to make a proper review about the palette with some swatches too so you will know what to expect if you decide to buy it ! This palette is basically a tin which has a magnet,so don't mind and stress if you want to travel with it because it's closed properly and keep all the precious shadows secure and safe!It contains 16 eyeshadows,made with real cocoa powder, and yep we can believe them because they smell delicious,like real chocolate! The reason that i fell in love with this palette is that it's so wearable,you can use it every single day and not get bored,which for me at least means a lot! Texture : No matter what eyeshadow texture you prefer,this palette got your back!It has a collection of mattes,shimmers,glitter and satin finishes,so it will make you somehow happy!Especially the satin feel so buttery! 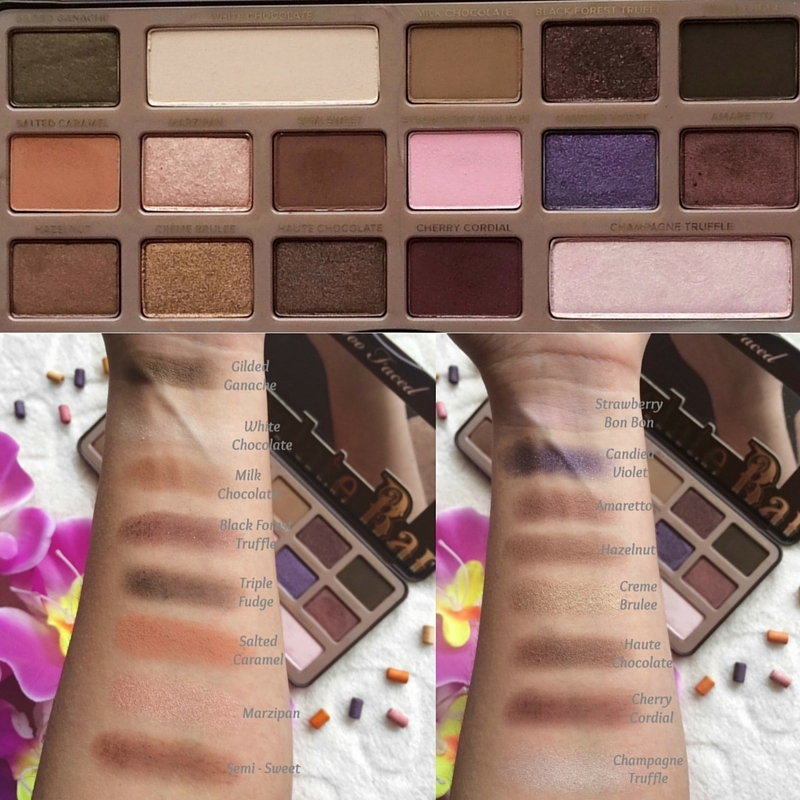 Colors : I think this palette is for you,who like neutrals colors.The most of them are brownish/taupe colors but has some pop of colors too,like those dark greens on the corners or the deep plums and purple colors on the center!I think that this is what make it so versatile,you can use it from day to night and create so many different looks! Pigmentation : It's one of my first ''high end'' palettes and let me tell you that i'm amazed!You get the color that you want without use much,it's easy to blend and last for hours even without using primer!All the swatches that you see below created with just one sweep and the results are pretty amazing!! Overall, the Too Faced Chocolate Bar palette,is for you who are neutrals lovers and you are looking for a high end eyeshadow palette!Ofcourse,nowadays you can find neutrals palettes way more cheaper,i love mine but don't get me wrong,this palette i think that deserve the investment and personally i consider it as my gem in my makeup collection! In the end of the day who can resist to a combination of chocolate and beautiful eyeshadows!! Do you ever tried this palette?Which is your favorite shade? p.s i will love to know what products do you want to review next or posts in general that you want to see on the blog!! Motivational Monday #24 : We're all Wonderwomen! !